More and more educators are not only using but also relying on technology to assist with teaching and assessing their students. Some educational programs are providing electronic devices to their exam takers, while others are requiring that students arrive to their programs with an approved device type. Regardless of whether institutions have a BYOD program in place or are issuing their own, testing on these devices has now become common practice and will only continue to grow in popularity in the next few years. Due to this growth in technology use within education, exam management software programs are experiencing expansion as well. An assessment and testing software can provide many benefits for educators and students alike; however, using technology for student assessment can come with associated obstacles. Regardless of the type or level of educational program, combating academic dishonesty is a continuous problem for educators. With the introduction of technology into the assessment process, many faculty see this addition as one more opportunity for students to have access to information that they should not have during an exam. Keeping exam takers away from external programs and saved files can be difficult without vigilant proctoring from faculty, creating even more work for them than when exams were delivered via paper. However, this problem can be nullified if the exam management software is capable of locking down the test-taking device and prohibiting access to any other applications or files located on the device. By keeping students confined to the exam files during their assessments, faculty have peace of mind knowing that students are not accessing information that could be used to provide them an unfair advantage on their assessments. 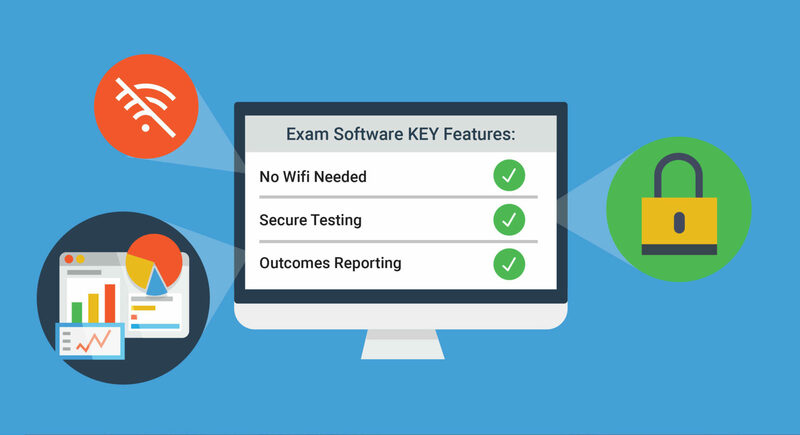 Another pain point associated with exam management software programs is their reliability on a stable Wi-Fi connection. If the exam tool is hosted online through a locked-down browser, the exam (and thus, student exam files) are dependant on a strong internet provider that is capable of maintaining its strength regardless of the number of connections within the room. This can be difficult for programs to achieve based on system bandwidth as well as the general construction of the institution. By selecting an exam management software like ExamSoft that does not require an internet connection during the exam, faculty and students have the peace of mind knowing that their assessments will be stable and their exam answer files will not be lost regardless of the number of exam takers or the size of the answer files. Additionally, not having an internet connection adds another layer of security for faculty who would prefer students not have access to additional information during their exams. Testing students using an exam management software is only the first step in truly maximizing the use of digital assessment. By categorizing or “tagging” exam items to student learning outcomes or course/program objectives, educators are provided with detailed information on how students are performing within these specific outcomes. Armed with these data, faculty can make informed decisions on student remediation or curriculum revision tactics to affect performance in a proactive way. On top of this, assessment data can be incredibly valuable for helping with accreditation review preparation. By tagging exam items to accreditation standards, it becomes an efficient process to report on how the program is teaching and assessing to those standards and then provide evidence of student learning based on those teaching methods. Education has already moved beyond the simple act of using an exam management software for student assessment. Now more than ever, it’s important to remember that the act of assessment should be intentional and that the software used to perform this act should achieve a greater goal than the general use of technology for testing. By selecting an exam management software that keeps exams as secure and stable as possible and also provides students, faculty, and administrators with the data needed to improve learning, the use of technology now becomes intentional and effective as well. Learn more about how ExamSoft’s assessment platform can help influence student learning and educational programs here.